Here at Eyeman Optometry we offer a wide range of services and treatments to best suit your needs. Hands-on Sports Vision Training is provided in our unique and top-of-the-range sports facilities. 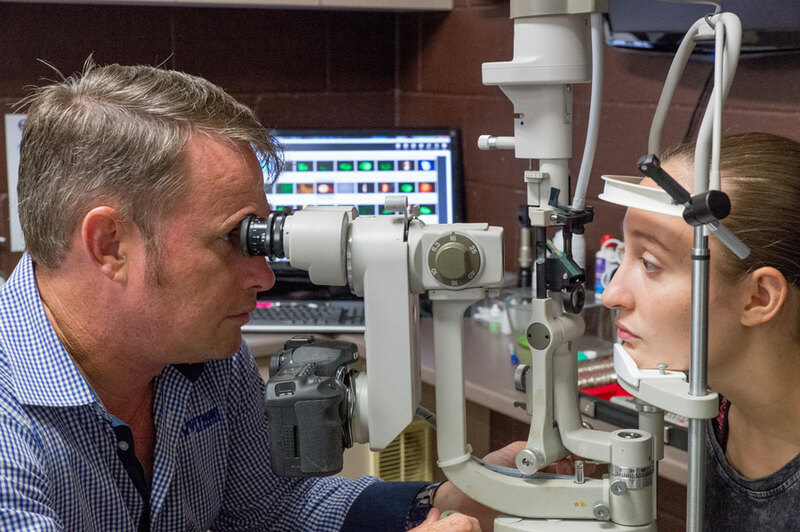 We can assist sports professionals with their vision training exercises through the use of MiSite technology, lens tint testing as well as techniques that are proven to improve your sports performance. Click here to read more about sports vision and our facilities. Packages to suit everyone is something we truly believe in here at Eyeman. That’s why we have a quality range of glasses that range from German Designer brands that are big on style and price, as well as reputable Australian brands that are stylish and pocket-friendly. Children’s optical equipment and frames are sometimes hard to come by. Eyeman Optometrists have a huge range of glasses to suit any size face! Our range include fully flexible hinges matched with tough lenses to help prevent breakages. We also offer a great range of UV protected sunglasses to protect their delicate eyes from the Queensland Sun. For more information see our glasses page, or drop by for a visit. Click here to read more about kids vision and how we can help. Contact Lenses are a constantly evolving science. We now have access to a wide range of technologies to suit your script and needs. If you would like to know more about what options there are for you, call us now to book an appointment! Click here for more information. We recommend you have your orthokeratology lenses cleaned by us every 6 months. It is very important for your orthokeratology lenses to be kept clean to ensure the best possibly results and prevent calcium build up. During this deep clean, Patrick will also check your lenses to ensure there are no signs of cracking. A Blephasteam will assist with dry eye and Blepheritis symptoms. We also offer other ways to assist with the relief of symptoms, including – heating packs for eyes, therapeutic sprays for temporary relief throughout the day and medicated eye drops. The Blephasteam treatment will require a 45 minutes consultation. We offer on-site Health Fund Claiming and Medicare Claiming for maximum convenience for you. We can process your health fund and medicare claims instantly in-store! We accept all of the main health funds including BUPA, Medibank, NIB and AHM and more. Eyeman Optometrists offer CASA Certified Optometry for pilots who need to renew their licences or need a health check up. We can provide in-depth, qualified optometry check ups for you through CASA. For this service, you will need to provide your identification as well as your ARN number so that we can book you in for a full hour of testing with Patrick. Click here for more information. Patrick checking a patient’s eyes.